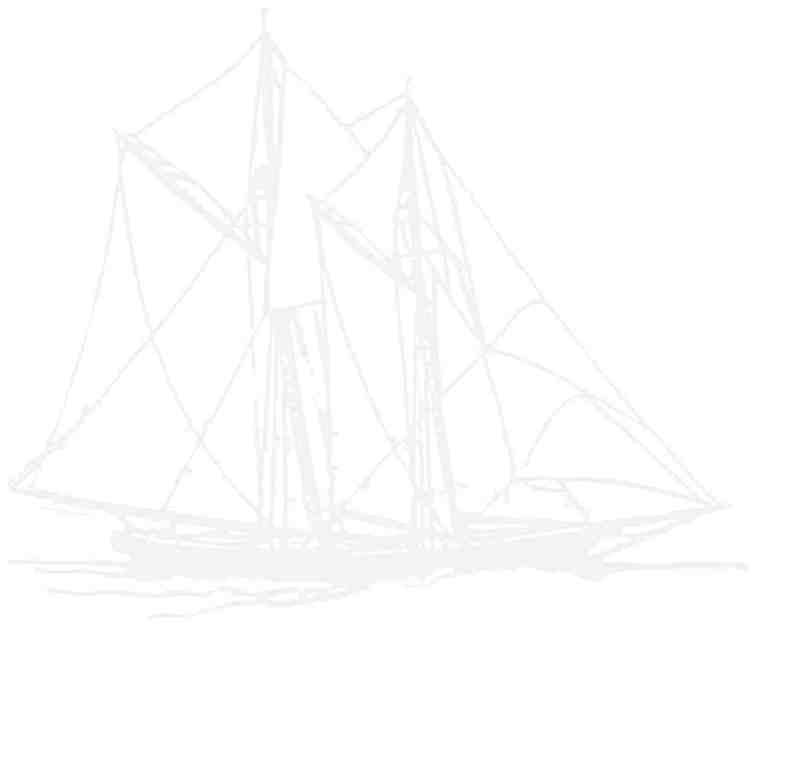 Extensive work starts in late April at Tonnessen Park and then on the railway at Kelley's this spring with a particular focus on the portion of the hull between the foremast and mainmast. 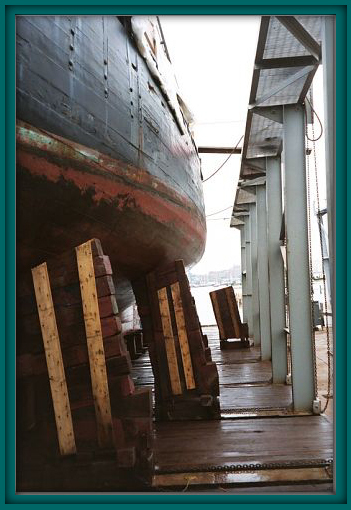 Planking is pulled away to gain access on both sides of the ship to inspect, renew, replace and refasten the frames (ribs) as they pass under the keelson and over the keel (backbone) of the ship. In order to accomplish this work from the outside, access is needed from the inside. 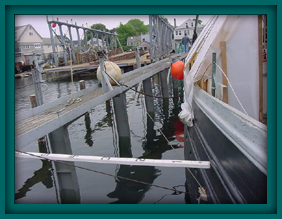 The fish hold sole planking, concrete and ballast had to be removed first. 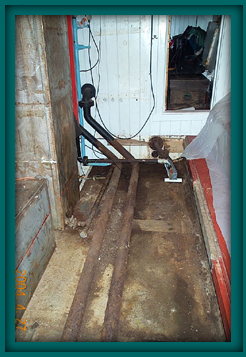 The sole (or flooring) in the fish hold was removed to gain access to the bilge and septic system plumbing along with the water tanks shown to the left. This is looking aft on the port side. 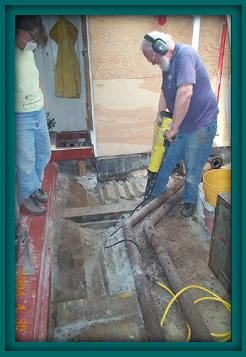 Marty Casey and Laurie Weitzen jack hammer out concrete to get at the lead ballast that must be removed to gain access to the ceiling planking. 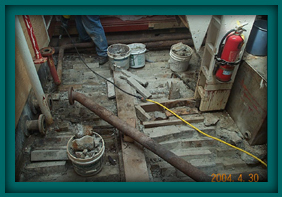 The upper surface of the 55 pound lead ingots are exposed. They all need to come out! 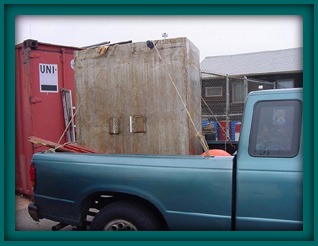 Part of the fresh water tank is taken over to Kelley's by land. 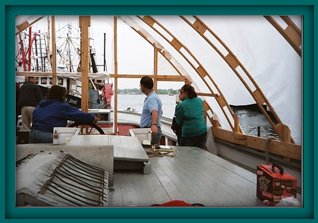 The tankage will be modified to allow more room in the fish hold including a larger central table. 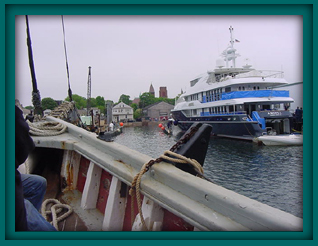 Gregg Swanzey and crew back out of the slip at New Bedford State Pier bound for Kelley's Shipyard across the harbor in Fairhaven. Capt. Doug Nemeth on the foredeck helps with the move. 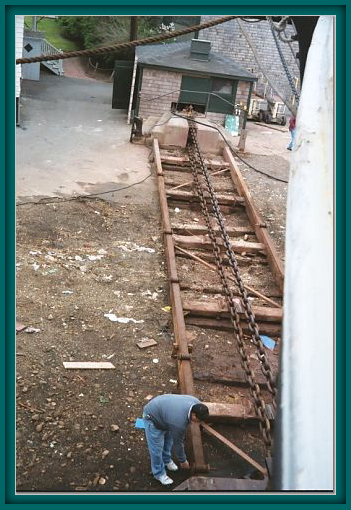 Ernestina is positioned by wire cables over her blocks on the railway. 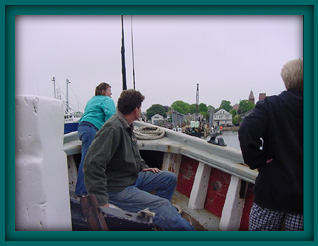 The Kelley's crew waiting to receive lines from the Ernestina crew. 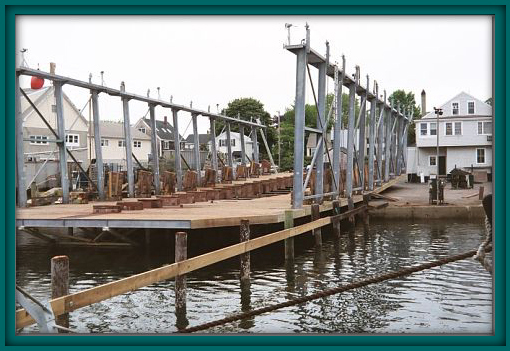 Here is a shot of the marine railway next slip over from ours. 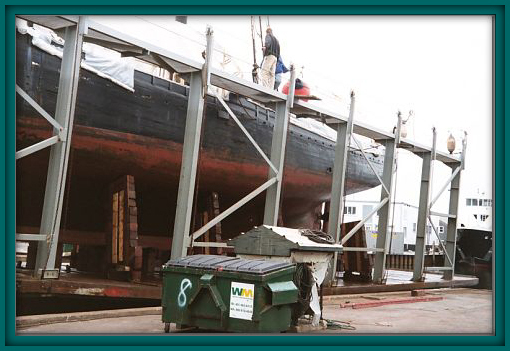 This one is out getting blocking in place for the next vessel to come up. 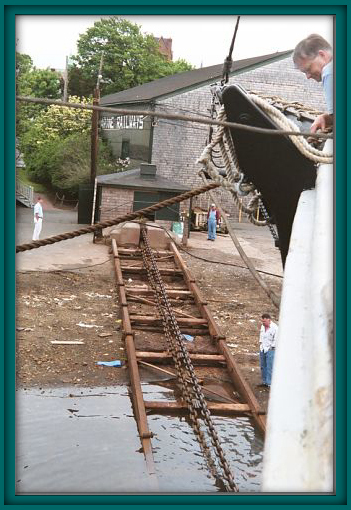 The large chain runs over a windlass and pulls Ernestina slowly up the rails on her cradle. 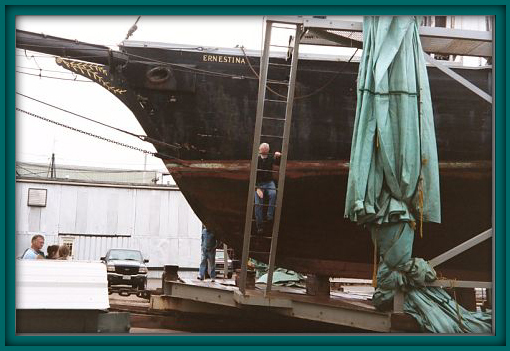 Ernestina is out of the water. 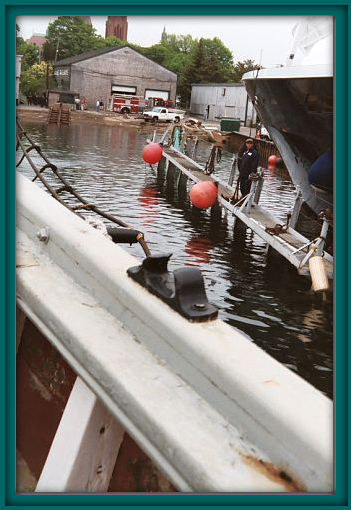 Engineer Steve Swift climbs down the ladder to inspect the bottom. Another view of the port side up on the railway.